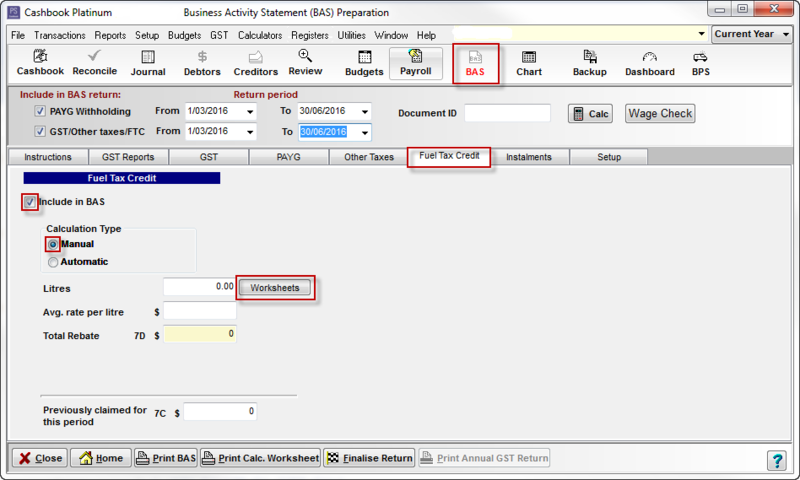 How do I calculate my Fuel Tax Credit manually for my BAS? Fuel tax credits provide businesses with a credit for the fuel tax (excise or customs duty) that's included in the price of fuel used in: machinery, plant, equipment, heavy vehicles and light vehicles travelling off publics roads or on private roads. The amounts depend on when you acquire the fuel, what fuel you use and the activity you use it in. Fuel tax credits rates also change regularly so it's important to check the rates each time you do your business activity statement (BAS). Fuel tax credit rates are indexed at least twice a year, (normally in February and August), in line with the consumer price index (CPI). The CPI is released towards the end of January and July. Fuel tax credit rates will be updated as soon as they become available. Rates may also change for fuel used in a heavy vehicle for travelling on public roads. This is due to changes to the road user charge which is reviewed annually. Note: There are time limits for claiming fuel tax credits, making adjustments and correcting errors - generally, you must claim or amend your claim within four years. Cashbook has the abilitility to automatically calculate your FTC amount for a selected period, but this can only be done if you have access to the internet. Step 1: Obtain the latest FTC rates (Rate $/Litre) for each rebate rate type. We advise you to contact your accountant to obtain the latest Fuel Tax Credit rates. Select your fuel account code from the drop-list in the Account Code box. 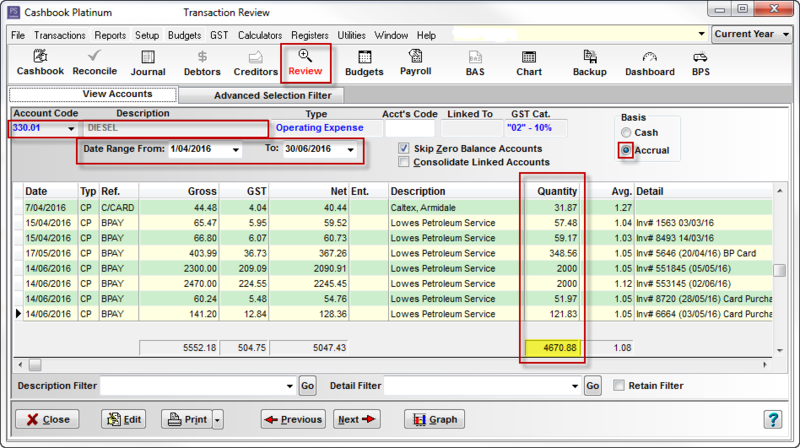 (or the drop down list in the Description list, depending how you have set up the order in which you like the chart of accounts to appear in dropdown lists.) e.g. 330.01 DIESEL. Set the Date Range (i.e. of current BAS) e.g. Date Range From: 1/04/2016 To: 30/06/2016. Make a note of the the Quantity total for the period. e.g. 4670.88. Basis: select Cash or Accrual. Repeat this step for each fuel account code. Manual calculation is done when calculating your BAS. Click on the BAS toolbar option. Click on the Fuel Tax Credit tab. Tick Include in Bas option, if not already ticked. Set Calculation Type as Manual. Click on the Worksheets button. Description: e.g Off-Road Diesel/Petrol or Diesel (Apr-Jun 2016). Proceed with normal BAS calculation.